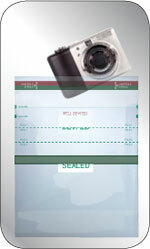 Digital cameras have become a valuable tool in the surgical suite. Recording procedures including resections enables surgeons to consult with peers in real time. Photos help educate residents on interesting or difficult cases. 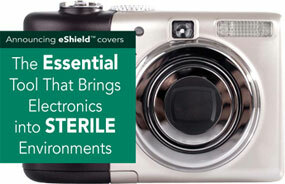 The eShield™ is the only FDA approved, disposable sterile cover created to enclose cameras so they can be conveniently positioned giving surgeons direct control of these devices from the surgical table eliminating the need to re-glove. 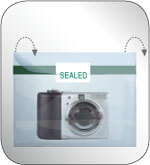 For digital cameras, the eShield™ includes an adhesive ring that holds the lens to the bag wall improving photo quality and eliminating unnecessary light. 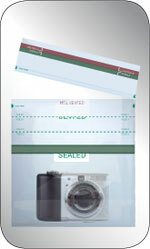 This real solution for a real problem lessens delays and interruptions which aids both patients and surgeons. 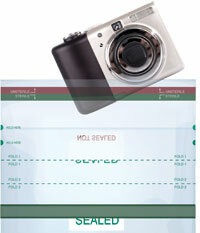 Ultra-clear polyethylene film for super sharp pictures. Touch screen compatibility with and without gloves. Nurses responsible for managing the OR can rest assured that the eShield is intended to help reduce disruptions and protect the sterile environment from contaminants on devices. Sony and most other cameras. 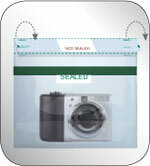 inserts smart device or camera into the eShield cover held by scrub person. 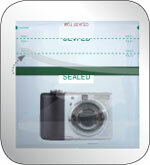 Scrub person tears off protective cuff and discards and then presses adhesive ring on camera bezel to wall of cover. folds again and seals cover. is ready for the OR!